"The Yoeman of the Pantrie (is instructed)... to carrie the salte with the carvinge knife, clensing knife, and forke, and them to place upon the table in dewe order, with the bread at the salte, and then to cover the breade, with a fynne square clouth of cambricke, called a coverpaine (which is to bee taken of, the meate being placede on the table, and the lorde sette) by the carver and delivered to the pantler". Plain woven linen napkin, towel or cloth. 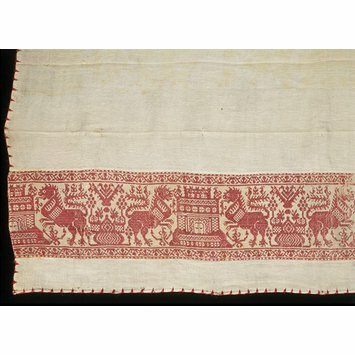 Approximately 4 cm in from each end a band 10.5 cm wide has been inserted, woven in red silk and cream linen, with a reversible pattern in point repeat of pairs of winged lions flanking a castle, and other ornamental devices; it is bordered by two integral narrow floral bands. Both of the inserted woven strips are seamed, suggesting this may be their second or later use. The whole napkin is edged with a simple line of red silk embroidery. The napkin was purchsed in 1880 from the J C Robinson collection. 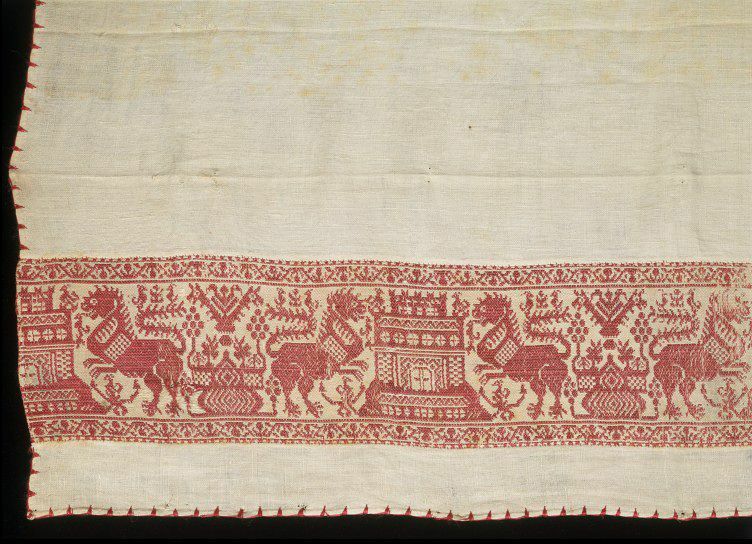 Historical significance: A significant number of coverpanes found in inventories from the middle part of the 16th century are described as of 'red silk needlework' or red 'Spanish stitch'. 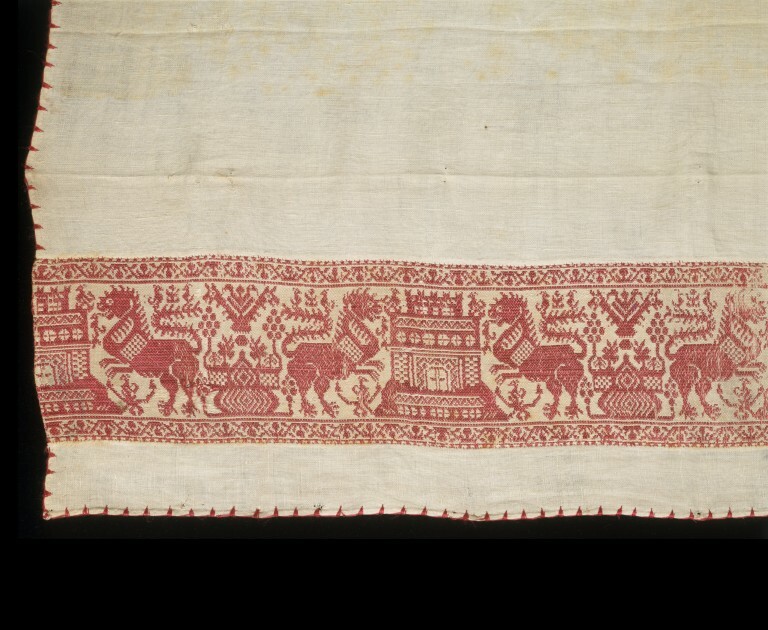 Spanish stitch may be interpreted as embroidery in double running stitch, which makes a reversible pattern, suitable for table linen, but it also seems possible that some of those referred to in the inventories were cloths with inserted woven bands, like this one; when the cloths also included embroidered detail the inventory clerks may well have used a single term to list them. For example, Henry VIII's 1547 inventory included "A towell and napkins there unto wrought with redde Spanisshe stiche mailed betwixt two borders". The woven bands are usually attributed to either Italy or Spain, and the patterns of some of them closely reflect the designs in pattern books and ornament engravings from the second quarter of the 16th century. However, the design of castle and lion on this cloth is not one found in Italian pattern books so far identified, and this may suggest it is more likely to be Spanish, with reference to the devices of Leon and Castile. On the other hand, the motifs of castle and lion do appear in other woven table linen from Italy, the type usually called Perugia towels. "The Yoeman of the Pantrie (is instructed)... to carrie the salte with the carvinge knife, clensing knife, and forke, and them to place upon the table in dewe order, with the bread at the salte, and then to cover the breade, with a fynne square clouth of cambricke, called a coverpaine (which is to bee taken of, the meate being placede on the table, and the lorde sette) by the carver and delivered to the pantler" (quoted by Mitchell, see refs). The size of coverpanes seems to have varied from between one and a quarter to one and three quarter yards in length (114 to 160 cm), and between three quarters and one and an eighth yards in width (69 to 103 cm). The larger coverpanes were presumably required to cover tall standing salts. Napkins were generally carried by servants, often draped over the shoulder. By the late sixteenth century the practice of providing each diner with an individual napkin started to develop. This beautiful example is embroidered with silk.